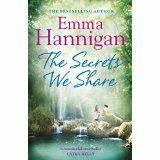 Many thanks to Frances Gough at Headline and Bookbridgr for my copy of ‘The Secrets That We Share’. Clara is facing old age and cancer and wants to repair the rifts in her family before it is too late. Her estranged son Max, in Los Angeles, has a daughter she’s never met whilst back in Ireland Clara’s unmarried daughter is rapidly turning to one night stands and wine in an attempt to mend a broken heart and find happiness. Each of them has at least one secret they are hiding. When Clara manages to track down her son Max it is immediately after Natalie, the grand daughter she didn’t know she had, suffers a tragedy. Natalie arrives in Ireland to recover and so this story truly begins. I have not read any of Emma Hannigan’s novels before and so wasn’t sure what to expect. It took me a while to adjust to the American phrases within some of the dialogue, but once I did I found they helped build the characters well. Each character, from matriarchal Clara to damaged Natalie, is flawed and in need of help. Often they behave irrationally and jealously in ways we can all understand. This gives depth to them and helps the reader empathise well with them. The plot is really fast paced with layer upon layer of secrets and revelations taking the reader through the Second World War to the present day. Clara’s past is gradually revealed through the letters that Natalie finds so that there is a real sense of time and history which is obviously well researched, partly from Emma Hannigan’s own family history. The end of the novel is satisfying and reassuring. There are important life lessons illustrated and the reader can learn a thing or two about how to live their own life through Clara’s words and responses. Big themes of secrets and forgiveness abound. One of the elements I really enjoyed throughout the book was the detail of the food described. And who doesn’t like a book that opens with a recipe for chocolate cake? I think readers who also love Maeve Binchy novels would thoroughly enjoy ‘The Secrets We Share’ and it would be an ideal holiday read for those who want plenty of emotion in their stories. Any book that opens with chocolate cake sounds good to me! I agree! It’s part of my staple diet!